Seaport Steel has an extensive inventory of steel products to meet the diverse needs of many industries. From our Seattle and Spokane warehouses, we serve the greater Northwest regions, and beyond. 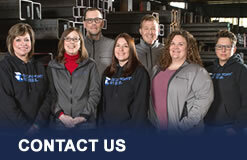 We pride ourselves on our knowledgeable and passionate customer service team. You’ll find they can provide for and source all of your product needs.